My advice is to read it with the lights firmly on! This is wise advice – though one particular story in this eerie collection may make you feel differently. Certainly don’t read it at twilight on a nearly empty train halted in the Sussex countryside as I did – way too much like life imitating art. 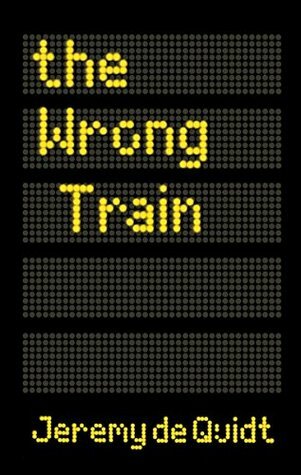 The Wrong Train has a locomotive structure – an opening story as the engine that pulls along eight other tales linked like an assortment of due-to-be-retired carriages. There’s a goods van of an ending too – which leaves you alone on an abandoned platform in the middle of nowhere watching faint red lights disappear. The effect of the progressively unsettling stories leads to a cumulative sense of dread. Not suitable for the easily unnerved. But for those of us who love a good scare (as opposed to gore and horror), The Wrong Train is ideal. I love how ghost stories unite readers of many ages – and this would sit well alongside any of Chris Priestley’s chilling Tales of Terror series. The cover and illustrations by Dave Shelton reflect the contemporary setting – but the scares inside resist being dated. It will be read again by the courageous and the connoisseur. Perfect for the Halloween season - if you’re brave enough to go aboard.